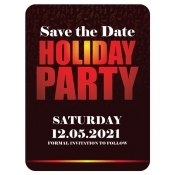 Holiday announcement save the date magnets are perfect to send holiday wishes or sending invitations for holiday parties. These personalized save the date magnets are usually sought by couples to wish their dear ones during the impending holiday season. Shade your thoughts with colors of joys and emotions through these customized save the date magnets. Free shipping offered. We also offer free art setup and free online design proof for these customized holiday announcement save the date magnets and other personalized magnets. A holiday season signals a time for refreshment because it helps people to relax and bond with their loved ones. If you wish to make this holiday season with your loved ones special then it is very important to inform them about your plans. Usually holiday season signals the end of the year and start of the new season. People generally love to celebrate the transition by organizing holiday parties or spending time with their loved ones. Usually they send out invites or intimation about their plans couple of months in advance. Full color holiday announcement save the date magnets are perfect for kicking the holiday mood. 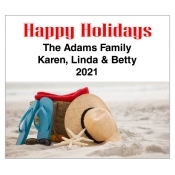 People love to retain colorful personalized magnets over their refrigerator doors and other visible ferrous surfaces because it serves as a reference and refrigerator art. A happy looking holiday magnet will remind them about an impending celebration and arrange their schedules or time to make it to the event. Perfect for bulk mailing or as an individual gift given during family events, individual celebrations or other occasions! It is very unlikely that people want to get rid of them because they love to decorate their refrigerator door with some colorful magnets always. This means these holiday announcement magnets are sure to retain footage as a memoir even, when the holiday season ends. It is perfect, when ordered in large quantities because we offer attractive discounts on bulk orders. We offer a large selection of customizable envelopes which allows investors to select the appropriate ones for mailing their save the dates. Customizable envelopes are offered at slightly higher charges. To know more about shipping, special value pricing, customizing envelopes/magnets and more, feel free to contact us at 855-762-4638 or write to us at info@cmagnets.com.